KHS ALITE 300 Hardtail with Alloy body Steel Cage Pedal with Nylon Strapless Toeclips as Upgrades and Taxes as Included $460. 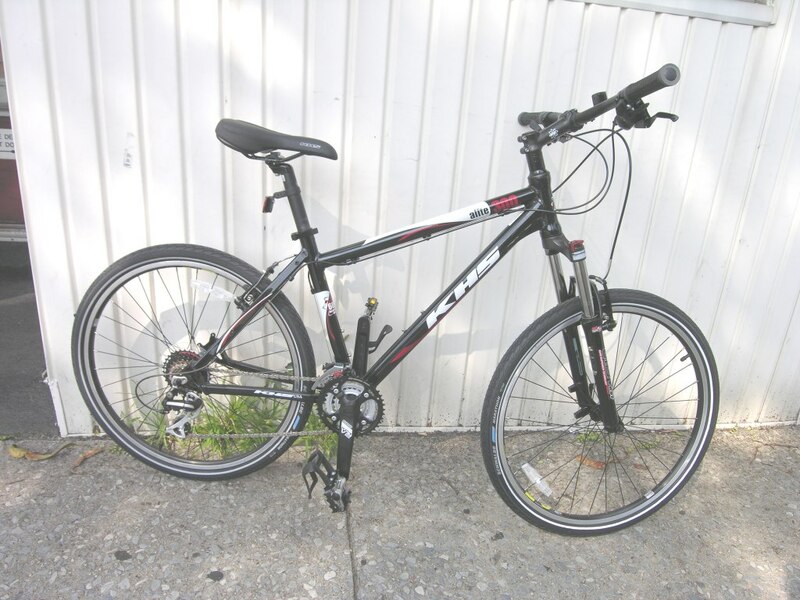 As featured in photo with $145 auxiliary extra 1.5″ 100psi Schwalbe Marathon street tire upgrade and 2nd tube set and Stop Flat II Tire Puncture protection liners add $100. With 2 tire sets trail and street $560 as featured. The Tire upgrade is optional and interesting as we deliver another $50 Savings and enable the bicyclist to be able to have the ALITE 300 morph from trail to street demon! Fast narrow profile higher pressure tires make the usually slow Hardtail bike really rip and still be capable of chasing trails sorta like getting 2 bikes for the price one.